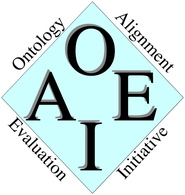 Conference track now contains 16 ontologies from the same domain (conference organization). These ontologies are quite suitable for ontology matching task because of their heterogenous character of origin. This year, evaluation will be supported by SEALS platform, see instructions. Aside automatic evaluation, we will do other kinds of evaluations, see section below. Results are available. Further evaluation methods and details are in progress and will be ready soon. This year participants will use SEALS platform to deliver their results, see instructions. Correspondences submitted via SEALS platform will be evaluated with several evaluation methods: evaluation based on reference alignment, manual labeling, data mining method, logical reasoning. Furthermore, participants can directly submit their 'interesting individual correspondences' ('nuggets') which could represent complex correspondences to organizers of this conference track, for contacts please see below. These correspondences will be evaluated manually. We deeply acknowledge the effort of contributors to the collection: Július Štuller (and his team), Dušan Rak, Petr Tomášek, Luděk Mácha, Lenka Navrátilová, Pavel Kříž, David Měrka, Roman Svoboda, Miroslav Joha, Tomáš Zelinka, Jozef Murín, Markéta Horáková and Stanislav Kolbe.